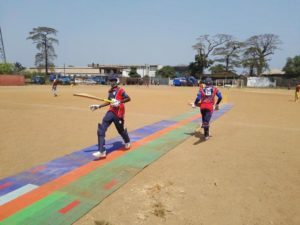 Midwest, Kent-SL and Crusaders youth cricket teams got-off a flying start in the Sierra Leone Cricket Association (SLCA)/Mercury International Youth ODI cricket club league, with a win over Old Princewaleans, Regent Olympic and Wanderers respectively. Midwest youth team were too strong for the Old Princewaleans, thanks to an excellent display of classical batting from skipper,George Edward Ngegba, John Bangura, Eric M Turay and Haroun Kamara. Midwest won the toss and opted to bat first and were able to score a massive total of 355 runs in 35 overs for the loss of three wickets. George Edward Ngegba scored 142 runs out off 65 balls, with a strike rate of 218.46. Other top scorers for the Midwest young stars were John Bangura 65 runs, Eric M Turay 60 runs and Haroun Kamara 33 runs. Samuel Humper captain of the Old Princewaleans youth team bowled 7 overs and conceded 41 runs with 1 wicket, Sheku Kamara bowled 7 overs and conceded 78 runs with 1 wicket. Midwest skipper, Edward Ngegba bowled 3.3 Overs, took 5 wickets and conceded 4 runs with a bowling economy rate of 0.03. Samuel Conteh delivered 2 overs, conceived 4 runs and took 2 wickets with a bowling economy rate of 3.0 an over. The Old Princewaleans youth couldn’t survive the Midwest bowling; as a result, they were bowled out for 21 runs in 11 overs. Edward George Ngegba won the man of the match, having scored 142 runs and took 5 wickets that propelled his Midwest team to a stunning 334 runs win. The second match saw Kent SL and Regent Olympic youth teams in battle, Kent SL won the toss and elected to bat first and were bowled out for 90 runs with Kent’s Ibrahim Bah 13 scoring runs. Despite a difficult clash, Kent ended their day on a considerable high with excellent bowling and fielding that led to 34 runs win against Regent Olympic. Gibril Sesay of Kent SL won the man of the match, having bowled 6 overs, conceded 13 runs, and took 5 wickets, 1 maiden with a bowling economy rate of 2.76 an over. The Crusaders won their match against Wanderers on Sunday.